Last month, I wrote about beginning an evening ritual as a way to relax and prepare for sleep after a long day. As I’ve learned more about the importance of self care, I found May Lindstrom’s name mentioned often. Her line of natural skincare products is designed around the concept of the ritual, and each item in the collection fills a specific role and purpose. May Lindstrom has a background as a chef, as well as a model and makeup artist, and her products are truly decadent. For my birthday, I tried two pieces from the collection, The Blue Cocoon, a beauty balm, and The Jasmine Garden, a refreshing botanical mist. Since May Lindstrom is a luxury skincare brand, I first ordered samples to try. This is a great way to test out products and colors to see if they work well with your skin, and most natural skincare stores offer small samples for reasonable prices. Eco Diva, one of my favorite sites, provides a five-product sample set for $10, and the samples are quite generous. The Blue Cocoon is my favorite piece from the May Lindstrom collection and it is truly a luxurious balm that can be used anywhere you need a bit of moisture, including your face, under your eyes, your lips, and even your elbows. Since I have oily skin, I use it sparingly on dry spots and rub a generous amount onto my neck and wrists each night before bed. This balm contains blue tansy, which possesses calming qualities similar to lavender, and gives The Blue Cocoon its lovely color. I find the scent very soothing and relaxing, and I’ve come to associate it with falling asleep at night. The balm is firm in the jar but melts as it touches your skin, so a little goes a long way. Plus, May Lindstrom’s products are natural and made without preservatives, and once opened, the jar will last for an entire year. That’s plenty of time to use this beautiful balm, and it has become a staple in my evening routine. 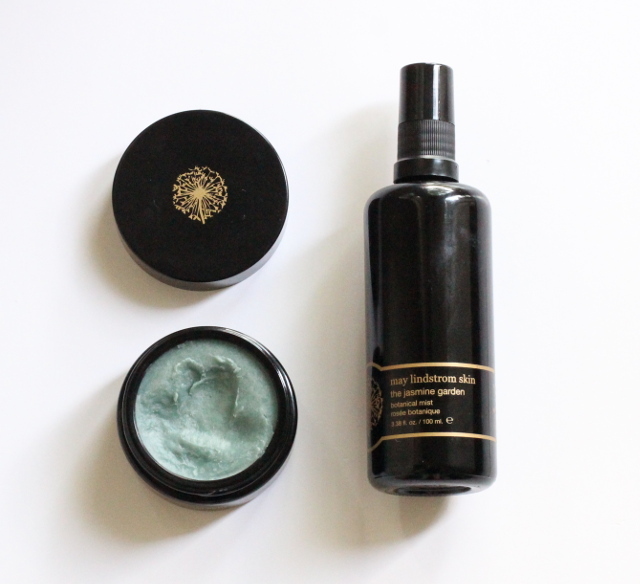 The Jasmine Garden, a refreshing facial mist, was my introduction to the May Lindstrom line. I enjoy facial sprays, especially in the warmer months, and I reach for one regularly throughout the day to set my makeup and refresh it as the temperature rises. This spray is scented with florals, and at first, I found the ylang-ylang a little overpowering. It soon grew on me, though, and I used the bottle every day, perhaps a little too often, since it didn’t last the entire month. It’s a lovely scent, but I find the price a little steep for a simple facial spray, which is the hot new product among many natural skincare lines right now. I haven’t reordered this spray, and I probably won’t, since I have tried other brands that are more affordable and work just as well. But, if you’re interested in trying May Lindstrom’s line, The Jasmine Mist is one of her most affordable products. May Lindstrom’s line is lovely and luxurious, and I can recommend it as a natural beauty splurge. Aside from the facial mist, you won’t find products like hers elsewhere, and the experience of using them each day is definitely a sensual one.